This morning, whilst lying in bed and hoping for some inspiration to find me, I stumbled across this series by photographer Chino Otsuka. The series is called ‘Imagine Meeting Me’. 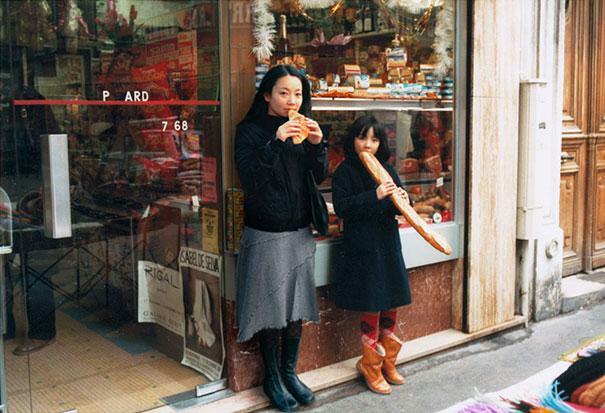 She takes images of herself as a child/adolescent, and inserts herself into the photo as an adult. The results are fascinating. So much of my writing is obsessed with childhood and memory; a friend once told me that my short stories had an ‘almost paedophilic obsession with [my] own childhood’, so naturally, I was delighted to discover these images. I encourage you to take a look through the rest. They’re touching, and very intimate. bright red in the bracken.